Thinking about my favorite Elvis Costello song the other day invariably brought to mind an album that sports an excellent cover of “Just A Memory” among its manifold delights. I was an early convert to the talents of Marti Jones. I had read a review somewhere of her debut album, “Unsophisticated Time,” and having soon obtained it, I was treated to a fine selection of material culled from the songbooks of the dBs, Richard Barone, Elvis Costello and her future husband Don Dixon. Don’s Chapel Hill cohort Mitch Easter also showed up to further salt the pot with power pop goodness, but taking center stage was the achingly emotive voice of the singer herself. Yes, the famous Zorch Tube Defobulator. Take that, Brian Eno! When her sophomore album dropped, I was waiting to pick it up. “Match Game” upped the professionalism ante but still delivered an album that dovetailed neatly with the impeccable pedigree of her unsung debut album. Don Dixon’s production reveled in the cream of mid-70s power pop influences and he pulled out the stops to make this collection as ear-friendly as possible. The hints of quirkiness still manifested on a cut like “Touch Tone,” but the preponderant mood seemed to be, “let’s get her on the radio.” Fortunately, with material and performances this good, I could only roll over in puppy submission. The opener pulled out all of the stops and “We’re Doing Alright” plays its royal flush straight off the top of the album. They weren’t fooling around on this one. Darlene Love was even pulled in for backing vocals. The Reed Nielsen song was a would-be country tune pulled into pop rock territory to very strong effect. Dwight Twilley penned “Chance Of A Lifetime” for this album and didn’t get around to releasing it himself until 2004. Mitch Easter took the lead guitar solo on this winning tune. Marti and Don co-wrote “Be Myself Again” and once again, Easter popped up for support along with Marshall Crenshaw. Did I perhaps mention that Marti Jones records have some serious power pop credentials on board? The excellent cover of “Just A Memory” began with a brief string quartet interlude before the drum pattern faded in and Ms. Jones claimed the song for her own with her plaintive, aching vocals. For good measure, T-Bone Burnett provided the vibrato guitar hook while the piano solo before the third verse in the middle eight was courtesy of Paul Carrack, who walked a tight line between the Nieve original and the countrypolitan Floyd Cramer style. The arrangement is far from the skeletal original, but it works here due to the overall intimacy of the performances, which manage to smoke the Nieve/Costello live in NYC recording of the same version. The acoustics of the venue ultimately work against Costello there. The aforementioned “Touch Tone” is a definite throwback to the “anything goes” of her first album, with all of the instrumentation, including backward piano and predominant synths courtesy of Dixon. The looped backing managed to invoke hold signals for an effective, anxious feel. “Foolish Lies” was a zesty Richard Barone track that had lead guitar from Vinnie [Joe Jackson] Zummo and backing vocals by Anne Richmond Boston of the Swimming Pool Qs. Can we top load this disc with any more appropriate support talent? What about Gary Barnacle, who offers saxes on the closing cover of Bowie’s “Soul Love?” The rendition is a corker since it gratefully sounds nothing like Anthony Newley, and allows me to appreciate the song even more in the hands of Ms. Jones. In a decade or so, the emergent Americana radio format would have been all over this disc, but we have to be thankful that everyone involved didn’t wait for a cozy berth to slot into the radio. This record was made instead with every ounce of talent and love that the participants brought to the table at that point in time. Marti Jones would not be a significant writing presence on her albums until her fourth LP, “Any Kind Of Lie,” but until she was ready to step up, let’s be thankful for her productive and sensitive pairing with producer/music director/husband Don Dixon. Together, they, along with their friends and cohorts produced a series of enjoyable albums that pulled from the finest British and American songwriters [including Dixon] that made a valiant [and aesthetically successful] attempt to produce high quality pop music for adults drawing from the best traditions of the 70s and 80s power pop values. This entry was posted in Record Review and tagged 1986, Don Dixon, Marti Jones, Match Game, Mitch Easter, Richard Barone. Bookmark the permalink. 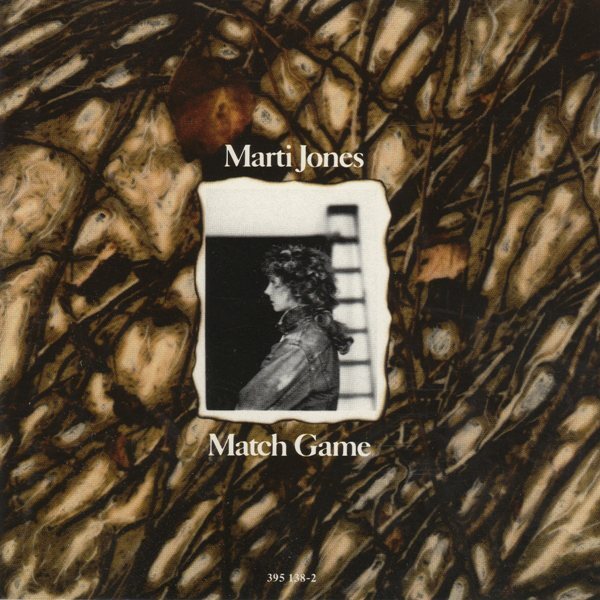 Ah yes, I need more Marti Jones in my life. Her cover of “Soul Love” was sublime as well. chasinvictoria – And you with your Anne Richmond Boston torch!